The Scala supports the Cinema Museum! Last Wednesday 26th September, London’s much-missed Scala Cinema reopened in the same King’s Cross building, for one night only, to launch a major new publication “Scala Cinema 1978-1993” by Jane Giles (FAB Press). Lavishly illustrated with over 1000 pictures, including every Scala monthly programme from 1978-1993, the book presents a history of the Scala going back to its’ roots in 18th-century Fitzrovia. The launch event captured the essence of the Scala, with a Space Invaders tournament; the screening of trailers for some of the 4200+ films that showed at the cinema; a display of martial arts in memory of the Kung Fu films which screened on Sundays; a dance homage to the Scala’s most-screened film Thundercrack! ; live music from Cramps tribute band Das Clamps, and Simon Boswell & his band playing his iconic soundtracks to Santa Sangre and films by Dario Argento. And as a nod to the many benefit screenings that were a regular part of the Scala programme, the event included a raffle which raised over £250 for the Cinema Museum (we’re happy to have provided some of the pictures in the Scala book). 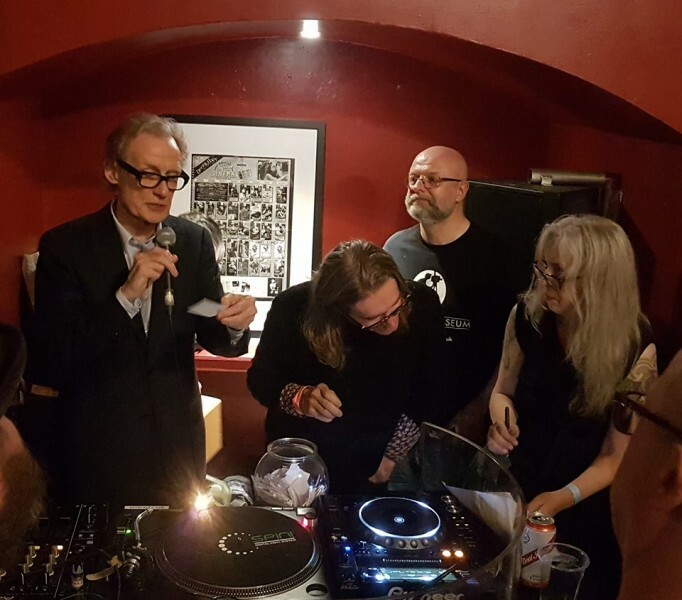 The raffle was drawn at 9.30pm by special guest actor Bill Nighy, pictured here with producer Stephen Woolley, Phil Clark of the Cinema Museum and author Jane Giles (photo by Ali Catterall). Among the 15 prizes, one for every year of the Scala’s run, were cinema tickets from Everyman, Picturehouse and Curzon, who also threw in some terrific Blu-rays, as did Arrow Films and Powerhouse Films; membership of the Regent Street Cinema; membership to MUBI (event supporters alongside IMDB and BFI/Film London); Shock Around the Clock collectables; a signed copy of Graham Humphreys’ Scala Cinema book illustration; a rare poster for the launch event; a framed Scala programme from 1992 and a signed copy of the book, Scala Cinema 1978-1993. Scala Cinema 1978-1993 by Jane Giles with a foreword by Stephen Woolley is available in shops from early November or in advance from FAB Press (www.fabpress.com).